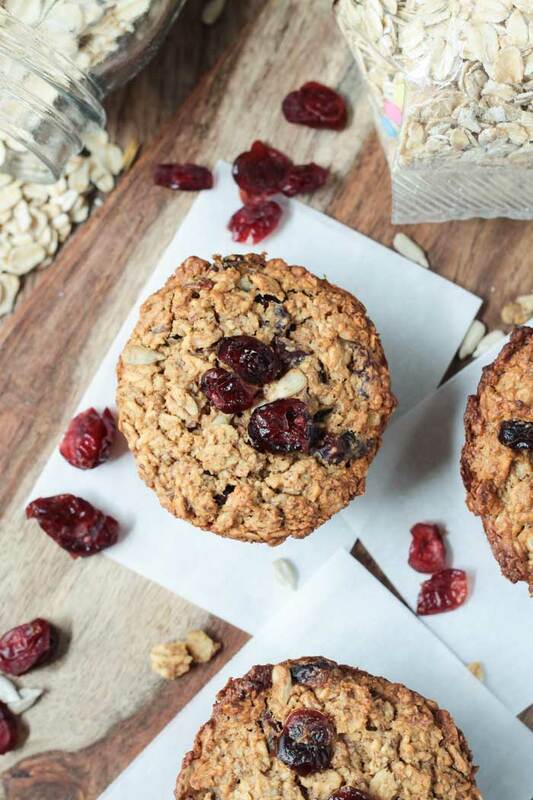 Baked Oatmeal Muffins with cranberries are the perfect back-to-school breakfast or snack. Perfectly sweet (yet refined sugar free! ), packed with fiber and protein, and easily portable. Bake up a batch today! We are full on in the throws of back to school. Alarm clocks, early rising, packing school lunches, scurrying to eat a quick breakfast, running to the bus just on time, after school snacks, homework, rushing off to baseball practice or games, fitting in dinner somehow, getting home late, baths, story time, bed, and then…..we do it all again the next day. Does this sound familiar? There is so much to do in the course of a day and so little time to do it. It’s important to me that we continue to eat healthy amongst the chaos, but it’s definitely more of a challenge. That’s why I love these Cranberry Baked Oatmeal Muffins. They are quick and easy to throw together, full of healthy fiber & protein, and no oil, no dairy, and no refined sugar. They are easy to grab-n-go on the run. Oh, they just happen to be gluten free and nut free too! Quick and easy is the name of the game around here – especially during crazy busy school days. These Baked Oatmeal Muffins can be made in about 30 minutes. And all you need is some mixing bowls, a spatula, and a muffin pan. Best yet though, is that after that initial baking time, you’ve got breakfast and snacks done for the entire week! Have a big family or lots of friends to feed? No problem. Simply double the recipe and make 24 muffins! They even freeze well and can be quickly reheated in about 20-30 seconds in the microwave whenever you need one. Less than 30 seconds for a healthy breakfast or snack – yes please! Oats are an incredibly versatile whole grain and we use a lot of them in this house. They’re high in fiber, which means they keep tummies full! 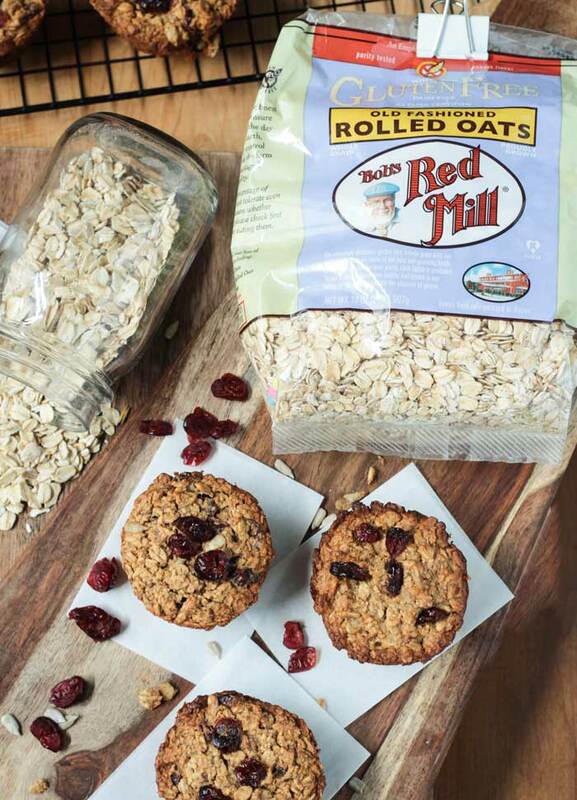 Bob’s Red Mill Gluten Free Old Fashioned Oats are always my go-to. It’s a company I trust for delicious taste, consistent texture, and reliable quality. Their gluten free oats are packaged in a dedicated gluten free facility and are tested every step of the way to ensure they always 100% gluten free. 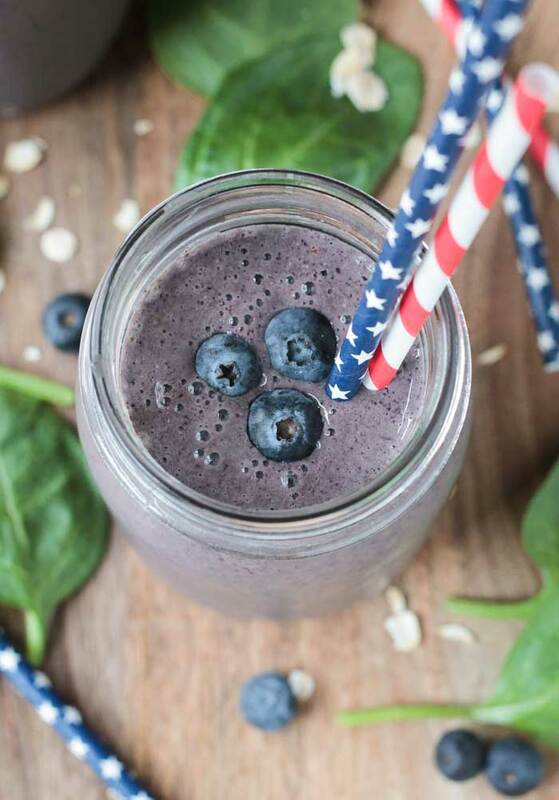 We use oats in oatmeal, granola, smoothies, desserts, and even burgers! Super versatile! Remember that chaos I told you about earlier? Hitting snooze one too many times or rushing off to practice right after school often means no time to eat a proper meal. Thank goodness these little muffins are perfectly portable! Your kids can eat one on the way to the bus. You can take bites between shaking the kids awake one more time and helping your littlest ones squeeze toothpaste on their toothbrushes. A container full of these babies goes easily with you to the ball field. You can even throw one in a lunchbox when you’re out of leftovers and don’t feel like making a sandwich. In addition to being totally yummy, (Dare I say, it’s my favorite baked oatmeal yet?? That honor used to belong to my Gingerbread Chocolate Chip Baked Oatmeal.) they are also totally packed with nutrition. Protein, fiber, healthy omega-3 fats, vitamin E, B vitamins, folate, magnesium, phosphorus, selenium, zinc, calcium, and more! Can your muffin do that?! 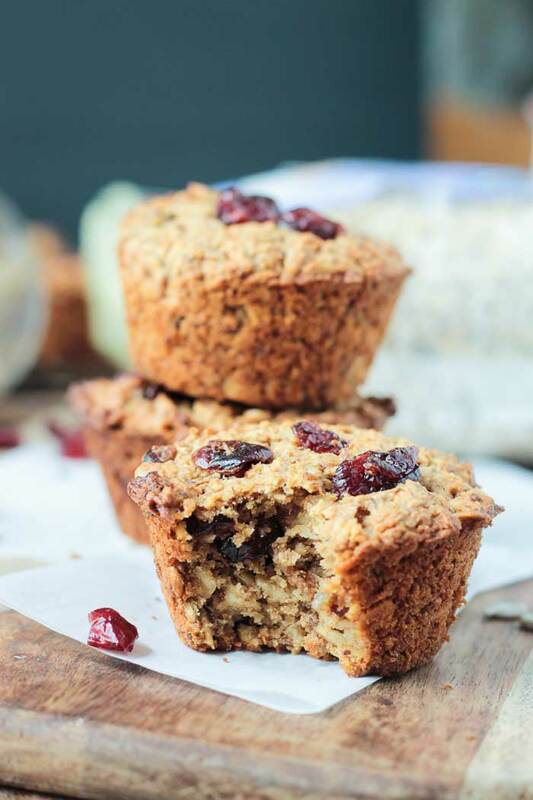 You guys are going to love these gluten free baked oatmeal muffins! As luck would have it, Bob’s Red Mill is kind enough to give you guys a coupon, so you can make them too! Please leave me a comment below with your feedback and star rating after you try them. I can’t wait to hear what you think! You can also find me on social media. Be sure to tag @veggie_inspired and #veggieinspired so I’m sure to see it. 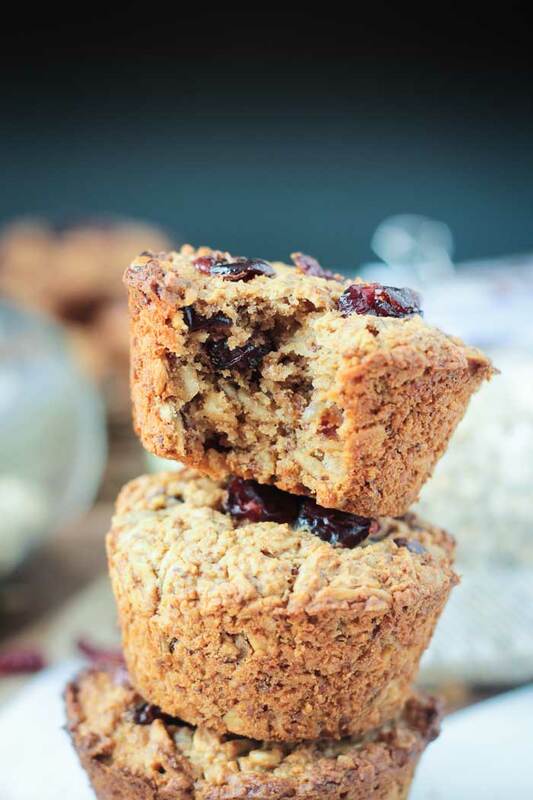 Baked Oatmeal Muffins with cranberries are the perfect breakfast or snack. Perfectly sweet (yet refined sugar free! ), packed with fiber and protein, and easily portable. Bake up a batch today! Lightly spray a 12-cup muffin tin with cooking spray and set aside. In a medium mixing bowl, stir together the oats, sunflower seeds, flax meal, baking powder, cinnamon and salt. In a large mixing bowl, whisk together the sunflower seed butter and maple syrup until smooth. Once smooth, whisk in the applesauce, non-dairy milk, and vanilla. Stir the dry ingredients into the wet ingredients until thoroughly combined. Stir in the dried cranberries until dispersed well. Spoon the mixture into the muffin tin, filling each cup to the top and pressing down to make sure it's compact. Bake for 20-25 minutes until the tops start to brown. Let cool in the muffin tin on a wire rack for 10-15 minutes. Run a knife carefully along the edge of each muffin cup to loosen it from the sides. They should pop out easily once loosened. You can eat them warm, or continue cooling on the wire rack until completely cool. Leftovers can be stored in an air-tight container on the counter for up to 2 days or in the fridge for up to 5 days. If you won't eat them all in that time, you can freeze them in a freezer safe container in one layer, or covered with plastic wrap on a baking sheet. Once frozen they can be transferred to a freezer safe plastic bag for easier storage. 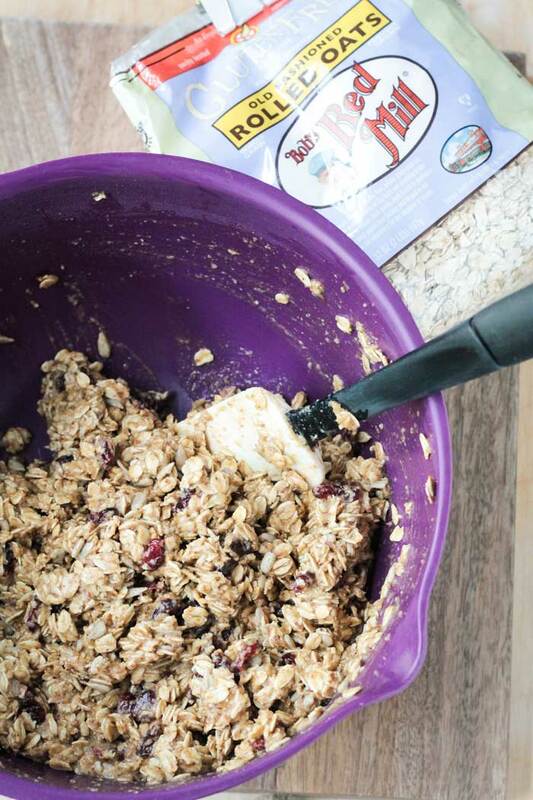 Alternately, this baked oatmeal can be made in an 8x8 baking dish. Lightly spray the baking dish with cooking spray or line it with parchment paper. Bake for 35-40 minutes until the top is firm and starting to brown. Hi, Robin! I’m so glad you loved them! They will be perfect for traveling! Have a great trip! I just made these with a few adjustments, and these are fantastic! Thank you so much for the share! That’s awesome. Thank you, TaKesha! So happy to hear you loved them. Thank you so much, Lucie! That is so great to hear! I hope you get a chance to make them. We have just gotten into the throes of school mornings again and it is crazy! 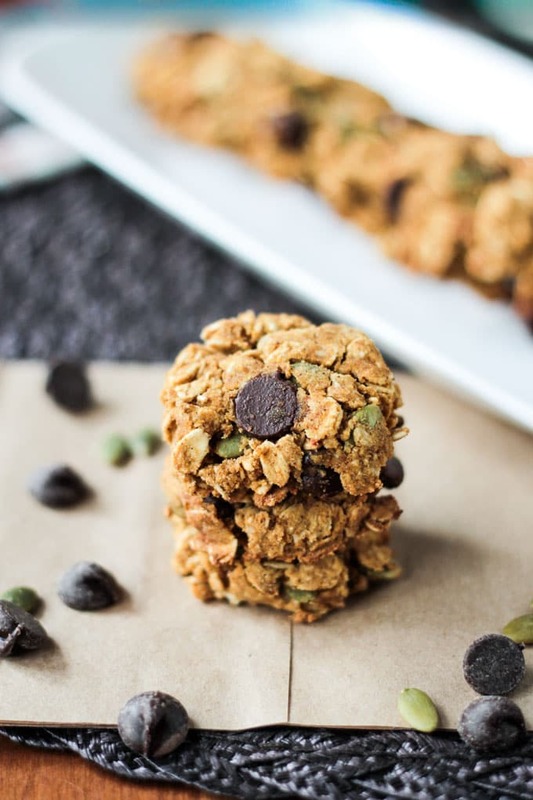 These are perfect for a quick breakfast or snack! School morning are so crazy around here. It doesn’t get much easier than these yummy muffins! Thanks, Sarah! This looks wonderful. A definite time saver! Thanks, Meg! They definitely make breakfast time less stressful! Yum! 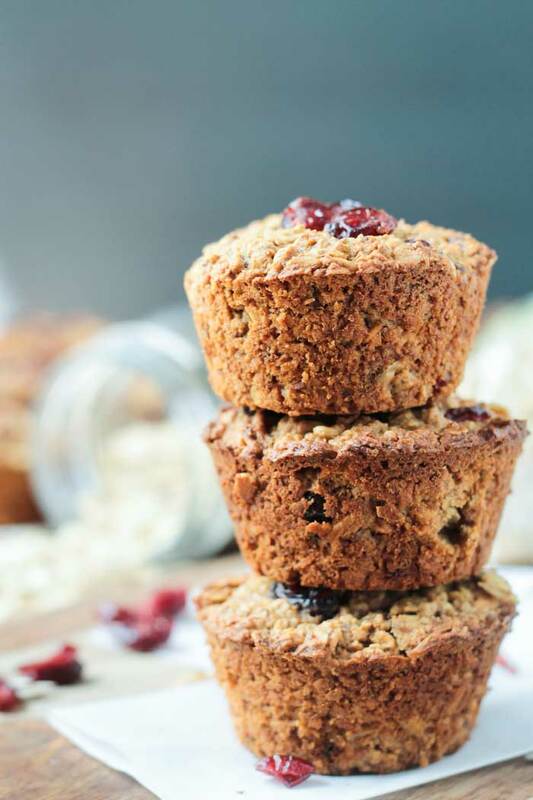 I haven’t had cranberry muffins in a long time but these look so tasty and healthy! I think you would love them, Mary Ellen! Thanks! These look fantastic! Can’t wait to try it! Thanks, Jill! I hope you enjoy them! There is so much to love about these muffins! Quick, easy, portable and delicious! Everything you want from a muffin! Aw, thank you, Lindsay! They definitely check all the boxes! Yay for team #BRMOats! We were totally on the same page here with back to school muffins- yours look super tasty! 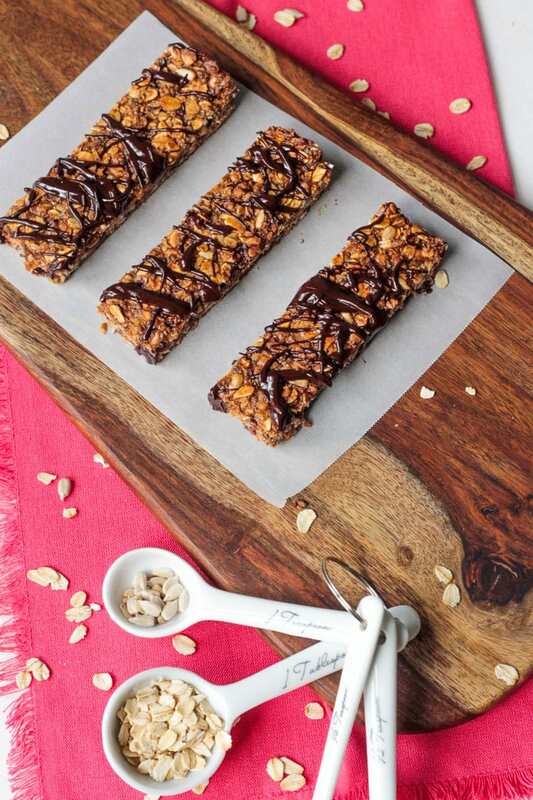 And those Tahini Dark Chocolate Granola Bars…YUM! Portable muffins – the best! Love your savory version too! And, yeah, those Tahini Dark Chocolate Bars are one of my faves for sure!! Thank you! What a wonderful muffin recipe. I love the oats in it! It really makes it much healthier! So pretty too. I have open dried cranberries and applesauce to use up – I think these muffins may need to get made! It’s meant to be, Alisa! I hope you love them as much as we do! You had me with quick and easy! My little guys is not ready for school yet, but we would still love these for breakfast! Oh, yeah, good for so many reasons – not just back to school. Thanks, Emily! I love baked oatmeal muffins, especially for those mornings we need a grab and go breakfast as we’re rushing out the door. Can’t wait to try your flavor combo! Well, it’s a good thing these are not traditional muffins then! 🙂 They are not at all cakey, like a traditional muffin would be. It is very much oatmeal, just baked to hold up in the muffin form. If you try it, let me know what you think!